Greenhouses are the latest trend in cannabis cultivation. With a cheap structure, and less lighting and venting than indoors, growers can harvest year-round at almost all latitudes. It is hard to hide the truth: unless special measures are taken by the grower, indoor cannabis cultivation is not environment-friendly at all. From the small grow box to the legal industrial growing facility, they all have a significant power consumption – largely due to high power lights that attempt to replicate the sun, and ventilation systems that control temperature and odour. Prohibitionism pushed cannabis cultivations indoor, but now it’s about time we took the plants back into the sunlight. Greenhouses are the right way to provide consistent cannabis harvest all-year round while minimizing power and carbon footprint. For the legal market operators, cutting down their carbon footprint is both a responsible business goal and a cost-saving strategy over the long term. For the small grower, it’s exactly the same. In a greenhouse, the ability to manipulate lighting and add artificial light to sunlight is the first advantage over both outdoor and indoor growing. The cultivation period can be extended to fall and winter seasons by simply adding more lights during cloudy days, and progressively keeping them on longer in order to compensate the shortening duration of daylight. In the same way, natural light can be enriched with low-power electric lighting to start a new generation of plants even before the end of winter. It’s not just a matter of adding electric lights to sunlight. A well-designed greenhouse environment naturally rests above the low temperatures typical of open fields at night or early spring. During cold seasons, greenhouses can be easily heated, and even without a heating or cooling system, they can provide a good range of maximum and minimum temperatures at most latitudes and heights above sea level. This flexible microclimate also makes it easier and cheaper to reduce the risk of dry and hot conditions typical of summer indoor grow rooms. Air flows can activate spontaneously through windows because of temperature gaps, or be forced with fans. Solar radiations heat up the air and the soil, while transparent walls keep humidity and heat inside the greenhouse up to an adjustable optimal condition. Thanks to these features, a greenhouse allows for year-round cultivation, with precise control over climate and exposure to sunlight. Electric power costs are lower than in a grow room and despite this, harvests tend to be more consistent over time in quantity and quality compared to indoors and outdoors cultivations. If you are transitioning from an indoor grow, you can still grow in a similar way. Just like a grow box, in a modern greenhouse the grower can control the duration of light, assuring that cannabis plants receive sunlight for more than 12 hours a day during their vegetative growth phase. In the summertime long day season, plants’ flowering hormones can be triggered by obscuring the transparent walls to obtain a 12/12 light/dark period. Advanced greenhouses have automated curtains and heaters, air conditioning, dehumidifiers, fans, CO₂ injectors, plus all the environment control equipment and gadgets that people love to install. What works in an indoor grow can be effective in a greenhouse too, generally at a lower cost of exercise and environmental impact. It is worth noting that some of these solutions are a bit beond the hooby gorwer, but it shows why greenhosues are becoming so popular within the legal cannabis industry. If you want to maintain the natural phases of an outdoor grow, then things are even easier. There is no need for additional equipment, they allow you to let your cannabis flower for longer, and don’t require additional equipment until autumn and winter (if you want to keep growing through these). By growing in a greenhouse, you are essentially reaping the benefits of an outdoor grow, but with the added bonus of being able to manipulate the microclimate to your own means. While putting together a fully automated greenhouse can be expensive, starting with a simple one doesn’t have to be. Greenhouses can subsist as standalone structures, or they can be attached to an existing building. Extending a house or a warehouse with an attached greenhouse, instead of building an independent one, cuts down materials costs and complexity. A DIY greenhouse can consist of a simple frame of wood, plastic or light metal is covered with transparent or translucent material, and the job is (almost) done. In a modern greenhouse, nearly all of the beneficial solar light frequencies can pass through the glasses or special plastics allowing all the good photons to hit the leaves. This structure can be as large as needed and it’s commonly named a “cold frame”, and when provided with a heating system it becomes a “hotbed”. Multiple functional modules can be attached together to provide ideal conditions and space for each stage of plants’ life. 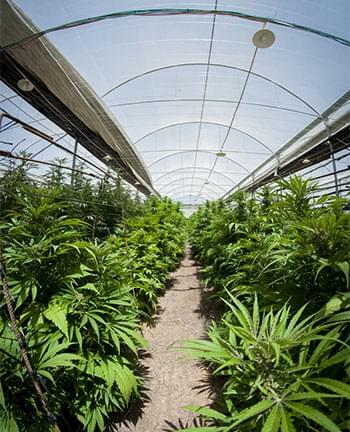 High ceilings eliminate indoor growth size restrictions, thus in greenhouses the average size of cannabis plants is larger than indoors, both in height and width. Plants can get so big they stick out of the roof windows. Modern greenhouses can be highly automated, with sensors connected to actuators which are able to open, close, increase, reduce or mix in order to keep any parameter that affects plants’ well-being at optimum levels. Even with a low budget and home-made approach to cultivation, a greenhouse is considered the perfect the efficiency and eco-friendly nature of a grow. In most continental countries, greenhouses allow to grow both periodic or autoflowering cannabis strains in almost any season, in the ground, pots or hydroponic systems. Today, most cannabis derivatives consumed in Europe and North America comes from greenhouses. Regardless the law, and just like other vegetables, cannabis has found its place in private and commercial greenhouses, and a new wave of energy-savvy growers is claiming its place in the cannabusiness.